Birmingham, November 1st, 2018: For the first time Metabo UK attends On The Tools Awards 2018 short listed for the Power tool brand of the year award 2018. On The Tools is a creative social media marketing agency boasting the largest online construction-based community in the UK, currently standing at over 2.5 million so Metabo were delighted when they found out they had been nominated for Power tool brand of the year at their upcoming awards ceremony. 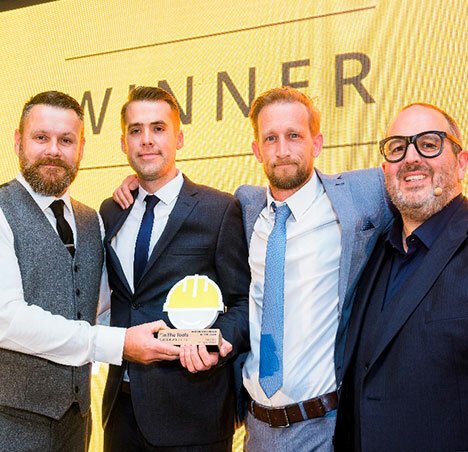 The evening event sponsored by Jewson is put together to celebrate and reward construction workers, sub-contractors, tools and equipment manufacturers and construction companies from across the UK. The evening started with a drink’s reception, followed by a fantastic 3 course meal and entertainment came in the form of funny man Justin Moorhouse, Comedian/actor as seen on Live At The Apollo, Peter Kay’s Phoenix Nights, 8 Out of 10 cats, Alan Davis and Coronation Street. In between courses gave plenty of opportunity for the representatives of Metabo UK, Kevin Rowles (Brand Manager) and Michael Adams (Marketing Coordinator) to network and speak directly to their target groups, in the room were also nominees for Apprentice of the year, Carpenter of the year, Electrician of the year and many other highly skilled individuals from across all industry sectors. So now it was time for the awards ceremony, 20 or so awards to get through before Addam Smith of Band of Builders steps up onto the stage to read out the shortlisted nominees for Power tool brand of the year 2018, In the category were Bosch Professional Power Tools UK, HiKoki (Hitachi) Imex Tools, TTI Milwaukee and of course Metabo. And the winner is………Metabo power tools! The eruptions of applause and cheers, especially from table 31 rang in the ears of both Michael and Kevin as they hugged each other in absolute amazement that Metabo UK had won such a prestigious award. After being presented with the award by Justin Moorhouse and especially Addam Smith which was another highlight of the night, Kevin and Mike were rushed back stage to give a short interview to camera, they thanked On The Tools for a fantastic night but paid special attention to the customers and supporters of Metabo UK and thanked all that had voted for them, “this award is much for our customers as it is for Metabo”. A real David vs Goliath story where the underdog came out as the winner!